Gandaki Province CM Prithvi Subba Gurung honors one of the members of Nepali Paragliding team that won silver medal in Asiad in Indonesia recently, in Pokhara on Friday. Picture: Rup Narayan Dhakal. By Rup Narayan Dhakal: Pokhara—Gandaki Province Chief Minister Prithvi Subba Gurung Friday accused civil servants of not supporting his government. Addressing the 24th Annual General Meeting and 13th convention of Restaurant and Bar Association Nepal (REBAN) Pokhara, CM Gurung claimed that the lack of government staffers’ support is hampering in the delivery of services and development works. “Civil servants are not confidence to this federal system,” he further added- they have doubt whether this system lasts long or not. CM Gurung also claimed that the federal government is not sending required number of staffers in province and local levels. So, according to him, the scarcity of staffers is hampering in service delivery. CM Gurung who organized a conclave of chief ministers in Pokhara, also clarified that the meeting was not against the Prime Minister KP Sharma Oli. ‘We actually want to create pressure to the federal government to forge required laws so that province governments also could promulgate needed laws without any controversy. He also informed that the Gandaki Province has already promulgated 18 laws and same number of bills are in pipeline. Saying that the federalism is in its infancy, CM Gurung claimed he would make Gandaki Province a number one from development and growth prospects, among all the province of Nepal. CM Gurung also talked about the upgrading of Prithvi Highway and Siddhartha Highway, high altitude sports center in Mustang and Pokhara-Manang tunnel way. He also underlined the need of road widening within Pokhara metro and stressed in the need of construction of numbers of five star hotels in Pokhara following the competition of Pokhara Regional International Airport. 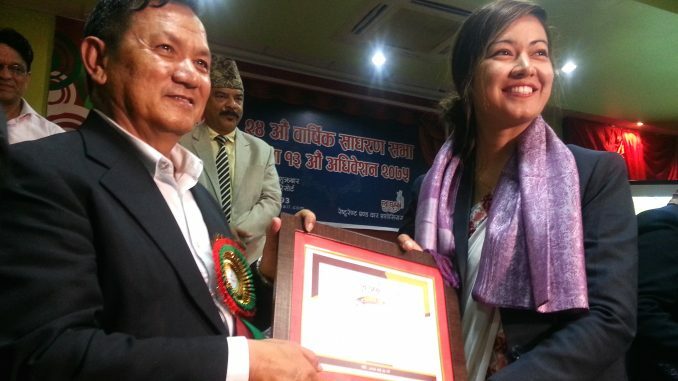 Journalist Sagar Raj Timilsina was felicitated in the program. Similarly, Hotel Raniban Arcade, Chilly Bar Restaurant and Mount Kailash Resort also have been felicitated as first, second and third respectively for serving good food in Pokhara Street Festival. Nepali paragliding team that won silver medal in Asiad in Indonesia was also honored during the program. REBAN center’s Pramod Jaiswal, REBAN Pokhara advisor Ganesh Bahadur Bhattarai, Nepal Airsports Association Chairman Yogesh Bhattarai, paragliding pilot Bimal Adhikari, Pokhara Tourism Council Chairman Kedar Nath Sharma, Pokhara Valley Urban Development Center Chairman Sundar Kumar Shrestha, REBAN Pokhara vice chairman Bhimsen Bhujel and general secretary Bishow Raj Paudel also expressed their views during the opening ceremony chaired by REBAN Pokhara president Chau Bahadur Gurung. REBAN will elect a new executive body for upcoming tenure today.